A recent incident where our Vice President praised his grade school sisters caught my attention. 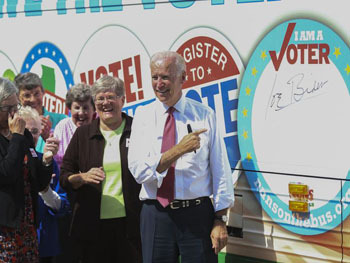 While promoting the Obama administration in Iowa recently, Joe Biden, a liberal Democrat and Catholic in name only, lent his “star power” to the inauguration of the 2014 “Nuns on the Bus” campaign that took off outside the Des Moines statehouse. This year’s theme is “We the People, We the Voters,” and the goal is to sign up voters for the midterm November 2014 elections. They are seeking out immigrants, the marginalized, the poor to sign them up to vote. If they take the pledge to vote, then they are invited to sign their names on the side of the bus. Now, top on the list of issues for these sisters are immigration reform, health care, and economic justice, certainly not pro-life or anti-“gay marriage” issues. “Vote people first” - is the motto. That is to say, vote Socialism first, vote Catholic second or not at all. The agenda is pure and simply social justice. The sisters are all aging with typical short hair cuts, many in the Nuns on the Bus signature blue t-shirts, all in secular dress, in short, the modern “sister.” “Vote people first! 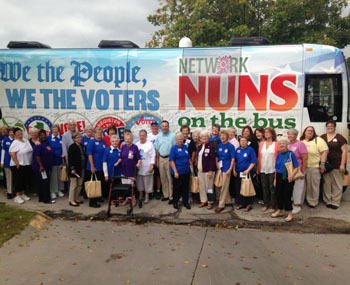 Vote people first!” shouted these sisters and folks all gathered together on Day One of Nuns on the Buss. This translates quite simply to “Vote Democratic,” which explains Joe Biden’s presence for the grand kick off. Biden took the stage and addressed the crowd about the widening income gap and supposed “danger” this presents to democracy. He reminded everyone how the Nuns on the Bus in 2012 took to the road and “fought like the devil” for Obama’s health care. (A typical foot in the mouth metaphor for Biden.) Now, they are out again, fighting for respect for immigrants, protection of voting rights and social justice. First that’s not quite true, since the high school Biden attended was Archmere Academy in Claymont, Delaware, a Catholic all-boys establishment run by the Norbertine priests, not sisters. Second, the sisters that taught Joe Biden – born in 1942 - in primary school are a far sight different from the “nuns on the bus” whom he praises so highly today. Like Joe, I also had the advantage of a pre-Vatican II Catholic education with sisters in habits as teachers. 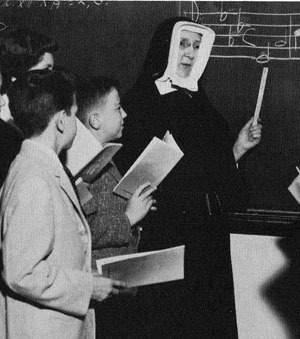 These sisters dedicated their lives to educating Catholic children in religion and morals, a no-frills and no-excuses education. We obeyed the sisters who obeyed the Magisterium. We honored the sisters for their great sacrifice, reflected in their demeanor, dress and discipline. The sisters whom Biden superciliously tells us to obey are the very ones who notoriously stand against Church doctrine. 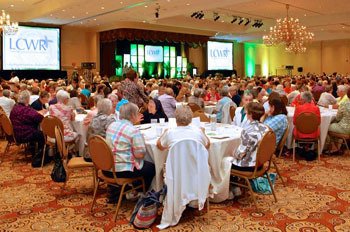 All are members of the LCWR (The Leadership Conference of Women Religious), who supposedly represent about 80% of the 51,600 women religious left in the United States. LCWR has been undergoing a Vatican-ordered doctrinal assessment since 2009. In 2012 it was commanded by the Congregation for the Doctrine of the Faith to reform its statutes and appointed Seattle Archbishop Peter Sartain to oversee changes. Although much fuss about this supposed call for reform is made in the media, in fact the Vatican has done nothing substantial to change the position of the sisters. I followed their four-day assembly held this August 2014 where 750 of the group's 1,400 members met. Archbishop Sartain was present, silent and “listening intently” as speaker after speaker got up and reiterated their commitment to their radical progressivist agenda. Directly challenging Vatican guidelines, the assembly bestowed its top award on feminist theologian Sr. Elizabeth Johnson, who told members to keep going despite pressure because the “sisters are ahead of the Hierarchy in living the Vatican II renewal.” No one really believes that this Pope will take steps against these progressivist sisters. It is clear that “issues of social justice” are of pressing concern to the modern sister, not nursing the sick or teaching the youth in parochial schools. That vision of women religious in the Church is passé. Recently Sr. Jeannine Grammick, a notorious advocate for LGBT “rights.” presented her vision of religious life in the new millennium. She gleefully foresees a day – coming soon – where the three traditional vows of celibacy, poverty and obedience will be gone, replaced by a simple commitment to follow the Gospel. Gender, sexual orientation, marital status are all inconsequential, Grammick tells us. As for the vow of poverty, far from a virtue, “it is an evil that must be eradicated.” The new religious will strive to live a simple lifestyle and meet the needs of the poor. And as for the vow of obedience, there should be no formal vow to Church “superiors,” but rather just being true to one’s own convictions. As we see, there is no place for Church doctrine in this progressivist conception of religious life. We could dismiss this as ridiculous, except for the fact that today this is exactly what is being lived in religious life in most of the LCWR communities. Grammick is excited for the first time that, “in this new era ushered in by Pope Francis,” we have reason to hope – or fear, as the case may be – that the decentralized, feminized, collegial and democratic Church of the future is on our doorsteps. This is the Church welcomed by Joe Biden and fellow democrat Nancy Pelosi, a Church akin to the Democratic Party and Socialism.